Editor's note: Our Splash Health, Wellness and Wearables event is coming up on March 23 in San Francisco. We'll have Steve Jurvetson (Draper Fisher Jurvetson), J. Craig Venter (Human Longevity), Patrick Chung (XFund), Risa Stack (GE Ventures), Paul Willard (Subtraction Capital), Steve Jurvetson (Draper Fisher Jurvetson), Julie Papanek (Canaan Partners) and more. Check out the full lineup and register for tickets before they jump! If you’re a healthcare startup and you’re interested in being part of our competition, learn more and register here. You know how you go to the doctor and sometimes they have those channels dedicated solely to healthcare news? It can be kind of annoying but, honestly, I actually prefer that to those offices that make you sit there and watch CNN or Fox News. At least I can more easily tune that one. Get ready to see a lot more of that kind of content, now that two of the biggest companies in the space are combining forces. ContextMedia, a provider of digital health information, acquired patient education media company AccentHealth, it was announced on Wednesday. No financial terms of the deal were disclosed, but it was revealed that it was an all-cash purchase. Founded in 2006, ContextMedia's solution includes The Digital Waiting Room Screen, which curates programming that is customized to each office according to its specific patient population; Patient Mobile Connect, which gives patients access to complimentary WiFi; The Digital Exam Room Tablet, which features patient-directed navigation of actionable health information and rich media; and The Digital Exam Room Wallboard, which allows physicians the ability to educate patients with 3D responsive anatomical diagrams. In 2016, ContextMedia currently serves 31 million patients monthly, is in 25,000 physician practices, with 125,000 HPCs in its network. It's been adding nearly one percent of all practices in the country each month this year and expects to have a presence in seventy percent of all practices in the U.S. by 2020. Founded in 1995, AccentHealth operates the largest waiting-room television network, which provides exclusive CNN programming co-hosted by CNN’s Chief Medical Correspondent Dr. Sanjay Gupta and HLN host Robin Meade. It also features a companion network of printed Health Panels, interactive services, and sampling and distribution programs. AccentHealth's channel is currently seen in over 30,000 physician waiting rooms, serves over 70,000 medical practitioners nationwide, and reaches 173 million patients each year. ContextMedia says it will invest in bringing its technologies into AccentHealth's network of practices and, as a result, will reach 55,000 healthcare locations, making it "the largest healthcare decision platform at the point of care in the United States." 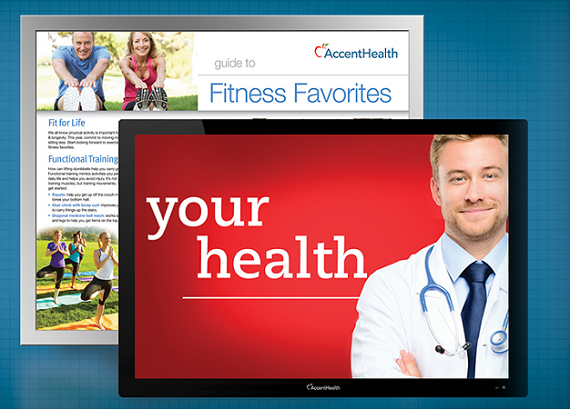 At the present time, AccentHealth will continue to operate as a distinct brand and platform, independent of ContextMedia. Both firms and their teams will operate with no changes in the short term. A joint Accent-Health ContextMedia team will be evaluating the platforms to determine the best way to grow the combined business in the future. ContextMedia also plans to make a significant investment in the technology, footprint and future of the combined platform. The transaction is expected to close by the end of the year subject to customary closing conditions. J.P. Morgan Securities LLC acted as exclusive financial advisor and Kirkland & Ellis LLP acted as legal advisor to ContextMedia. JPMorgan Chase Bank, Goldman Sachs and Citizens First Bank will provide financing. Moelis & Company acted as exclusive financial advisor and Alston & Bird LLP acted as legal advisor to AccentHealth.